Active faith is like measles? highly contagious, especially in pioneer fields. To keep it spreading, help converts and seekers to have a loving relationship with friends and family. To extract them from their social circle causes much needless persecution and sometimes death. It also causes a new believer to have an excessively private relationship with God, which is not biblical. However, separate a new believer from false friends who would supply them with drugs or something similarly destructive. Spread the gospel mainly by working in homes with whole households. This helps to keep seekers and new believers inside their social circle. Peter and his helpers in Acts 10 did not take Cornelius to a meeting where they would be in control; rather they presented Christ in Cornelius’ home where he was in control (Acts 10:24). Avoid entering into a seeker’s circle if you are of a very different culture and might stigmatize the Christian faith as foreign. Instead, let seekers and new disciples remain among their friends while you coach the disciples privately. Do not prevent new believers’ attending family events just because they contain elements of paganism. There are elements of paganism all around us in every culture, including the most Christian ones. To avoid paganism completely, one would have to step entirely outside of this world. Rather, urge believers to explain that they are participating out of respect for their family, and that they do not recognize that an idol or idolatrous practice in question is of God. This requires prayer and courage. Such pagan events include weddings, birth ceremonies, rites of passage such as “coming of age,” funerals and burials, patriotic holidays and local community festivities. Jesus attended many such festivals in spite of their evils. Many Christians have transformed pagan festivities by bringing Christ into them, replacing idols with wholesome activities empowered by the Holy Spirit. Use this skit to demonstrate unwise evangelizing by extraction. 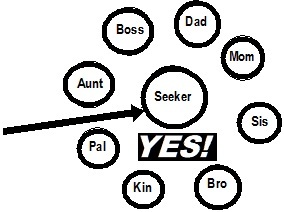 Have a “Seeker” stand in the center and point out others who are his family members and friends. Have them join hands to form a circle around Seeker who stays in the center. Tell Seeker that since he received Christ, you will protect him from his friends’ bad influences. Pull him abruptly out of his circle and warn him that his friends will drag him back into their world of sin. Introduce him to other people outside of the circle, and tell him that they are now his new family. Go back at the circle and ask what they think of the Seeker, and of you. Have Seeker get back in the circle again and demonstrate the right way. Tell him that Jesus’ greatest command is to love God and neighbor. He is to forgive these people and beg them to forgive him for any offence he has committed. Explain that in a society where a father would kill his son if he became a Christian, then let the son decide when and how to deal with the father. The son may choose first to show Christ’s love until the Holy Spirit softens the father’s heart. Ask folks to listen as you read Acts 16:29-32, so they can tell you afterwards what God promises to heads of families. Discuss ramifications of this promise for the way believers do evangelism.